They give little away on their own social media accounts but a little digging can find you a bit more about the London based female duo Ider. Like they’ve been around for only a few years and have already made an impact that’s seen them play some pretty cool shows and festivals, as well as gain critical acclaim from those in the know. I saw them play a festival in 2017 and haven’t managed that feat since… until now that is. 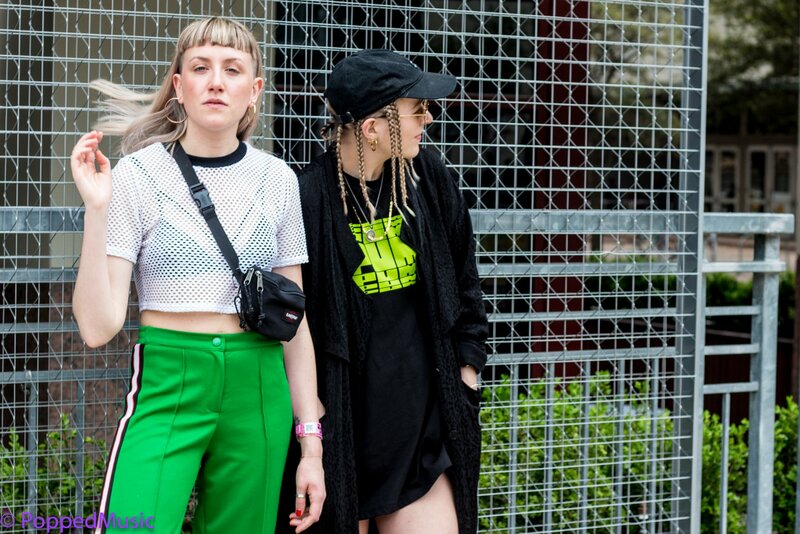 SXSW the festival that just gives and gives and now it allows us to give to you, SXSW with Ider…. For people who don’t know much about Ider what’s the background and how you came to be at SXSW this year. MEG: So we are best friends and we met at University and then we moved to London and moved in together a couple of years ago and we started writing and producing music and that is how Ider is Born. We went to Falmouth down in Cornwall and studied a music course and met there. How did we get to SXSW? Well we were going to go last year but it didn’t work out in the end as it was too early. We weren’t even a year old as a band so we knew we wanted to go this year. We knew definitely that it was something we wanted to do. We applied and we got some shows and we’re working with Glassnote Records. They’re based out here in NY and LA so it was about time we got over here to the States. MEG: It’s been amazing. It’s been a really incredible week. So much experience. There’s so much going on. We’ve met some amazing people. Really love this city. I don’t know if it’s just because the festival is on or what, but people are lovely. They start up conversations in a way you just don’t get in London. Have you had any challenges that you’ve had to deal with while here? LILY: Our drum had a bit of a meltdown during one of our gigs which is always that classic “sorry guys, technical difficulties” but it really was. So that was a bit of a difficult gig but it was fine, people were there with us and it was fine and we managed to figure it all out. Apart from that it’s been a really great experience. Better than we were expecting. MEG: The shows have been good. Have you discovered anyone new to you while you’ve been here? LILY: But you already knew him? LILY: But he was just so sass on stage. Suzi Wu, we saw a bit of her and she’s so great. She’s got something really good. Gothic Tropic, we played one of the venues with her and she was amazing. She’s got a really great personality as well. Do you have any advice for bands who are considering coming to SXSW next year? LILY: I think have a good little team with you, because there’s a lot of … well, if you’re a band like us, we have a lot of gear and there’s only two of us, so we have our manager with us and a sound engineer with us. You’re carrying a lot of stuff to gigs, you’ve got to have a solid team who are willing to sweat for you. MEG: It’s just about having those one or two people with you who can help out. Otherwise yeah I think, don’t take it too seriously. It’s all about getting stuck in and having fun. LILY: It’s so much fun to be here. SXSW is such a “thing” and in your head it’s something you want to do. It’s a landmark claim there, it’s amazing but just being here it’s just a buzz. Not taking it too seriously or getting too stressed out by the bad gigs because everyone’s having them. LILY: We have our next headline coming up in London at the end of the month which we’re really excited for. We’ve got lots of new music coming out. We’ve got festivals too. We’re going to Greenman and a few in Germany. Yeah, things are coming up which is exciting.